Scoopalicious: Happy National Ice Cream Month! Check back with us daily for news, recipes, interviews during the month of July. Today is also Creative Ice Cream Flavor Day. 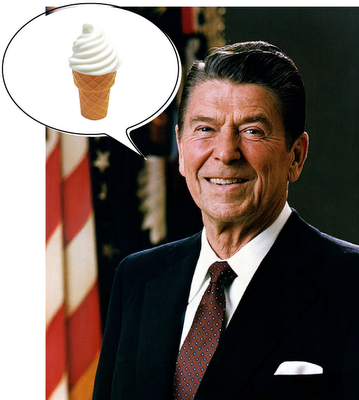 This one is not as "official" as National Ice Cream Month or National Ice Cream Day (also designated by Reagan -- it falls on the third Sunday in July) but it still gives you an excuse to eat ice cream (as if you need one!). One of the most creative flavors I have ever made and actually enjoyed in all it's creativity (because both garlic and durian fruit, while creative, just aren't that good) was David Lebovitz's Candied Bacon Ice Cream. What about you? Do you have a creative flavor you have either made or bought that is worth a mention? Ice cream image by ctechs at stockxchng. Happy National Ice Cream Month to the ladies at Scoopalicious! We're so excited about this month, we can barely contain ourselves...but we'll have to.